Webinars are an excellent component of a content marketing strategy. This low cost platform can be used to establish thought-leadership, drive website traffic, and generate leads. The trick is… connecting the dots between content, technology, and promotion. 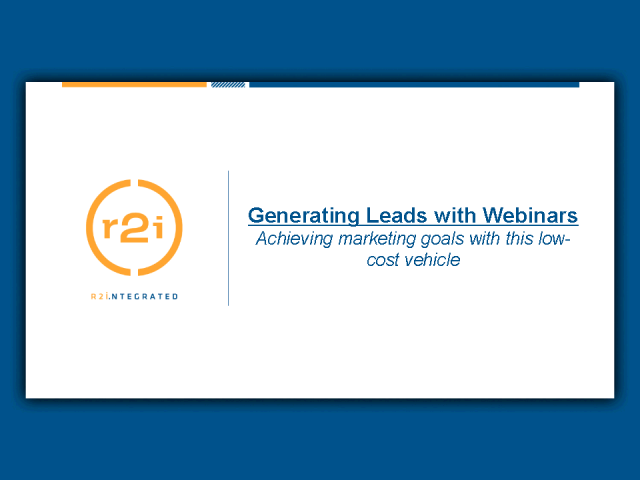 R2i will share the benefit of our experience and walk you through using this tool to achieve your marketing goals. We’ll also provide tips and checklists to manage the many components of a successful webinar campaign. What are the tools you can't ignore now? What tools should you not worry about? What developments in digital marketing are on the horizon that you need to be mindful of? What's the next big thing that could be a game changer? Leigh George, Senior Digital Marketing Strategist at R2integrated, helps clients develop, implement and track strategic plans for brand awareness, customer and member acquisition, relationship management, online engagement and community management using a combination of tactics. Leigh has a Ph.D. in branding history and theory from Binghamton University - one of only a handful of people in the country with that distinction. She is a regular speaker on digital marketing and social media topics, and her insights have been published online and in print. Unless you live in cave in the middle of nowhere, then you’ve probably heard of Foursquare, the geo-location social gaming platform. Millions of people around the world have signed up for services like FourSquare and Gowalla to keep track of their friends' whereabouts or search for nearby merchants and deals using their mobile phones, while customers are cashing in on deals through Groupon and LivingSocial. Why are these services so popular? What do these services have in common and how are they different? Why should you care? Your site looks great, but did you know that what’s going on behind the scenes is crucial to search engine optimization? In addition to numerous elements such as in-links, Google and other search engines recently began factoring Web page speed into their search result algorithm. But how can you begin to diagnose issues and find areas for improvement as a non-technical person? Through this comprehensive webcast, R2i will teach you how to identify website challenges, how to test them, and how to convey technical requirements and changes to your development team in order to improve your organizations’ site. R2i will share tools that will assist you in assessing challenges and compiling a list of issues for your web development team so you can increase the speed, performance, and searchability of your site. In this webinar R2i will present a look at the current state of the mobile market by analyzing the factors that are driving development decisions. Developers as well as technical decision makers will learn key functional facts on leading mobile platforms to help guide their decision-making process. This session includes a comparison of WAP vs. native platform solutions, including areas to consider upon initial deployment as well as post launch. Join us for this Webinar as R2i and BoxTone present best practices along with a case study of the success of the BoxTone Lounge. A recent R2i survey revealed that mobile marketing is an important component of 2010 marketing strategies, and that mobile app development is one of the most critical components of mobile marketing campaigns. Mobile applications constitute a channel for brand-consumer interaction that cannot be ignored. Brands must seize every available opportunity to invest in and enter the mobile app marketplace – or must they? Social media represents a powerful opportunity for marketers to multiply their messages amongst self-expanding pools of prospects. But specific sharing behavior can be difficult to generate and sustain. Next in our “Social Media for Profit” webinar series, we’ll discuss how to generate the right type of content, deliver it to the right people, and combine it with the right sharing mechanisms.